OK, so I'm reviewing Baldur's Gate: Dark Alliance a little late in the day. The game has been out for two years and has spawned two games based on its engine, both of which came out this month. But since we were planning on giving Dark Alliance II full coverage, we felt the original deserved the same. 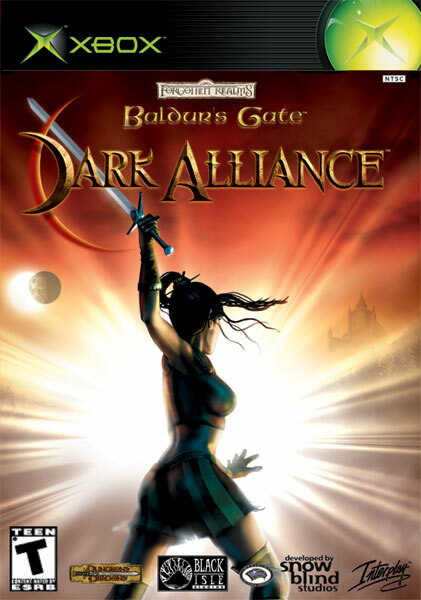 Dark Alliance originally came out on the Playstation 2 in 2001, likely as an experiment to see if the popular Baldur's Gate CRPG series could succeed in the world of console gaming. The experiment was apparently a success, because a year later Dark Alliance came out for the Xbox and Gamecube systems and Dark Alliance II went into production. Dark Alliance's publisher, the financially listing Interplay, abandoned Fallout 3 (the next game in the highly acclaimed CRPG franchise) because it hoped that revenues from Fallout: Brotherhood of Steel, a console title set in the Fallout universe and based on the Dark Alliance engine, would keep the company afloat. Role-playing gamers enjoyed Dark Alliance as a change of pace from thinky PC RPGs and an opportunity to enjoy a different kind of console RPG experience than that found in the Final Fantasy franchise and its imitators. Gamers who had shied away from RPGs in the past found the fast-paced combat addictive and the RPG elements non-intrusive, giving Dark Alliance a much broader fanbase that its CRPG titles. So now you're saying, "Thanks for the history lesson. Is Dark Alliance any fun?". Seasoned gamers should already know at this point whether Dark Alliance sounds like something they'd enjoy. For them it's a matter of deciding where they fall in the PC versus console debate and how much role-playing they need to have in a game to enjoy it. Because while Dark Alliance is fun, it's basically a hack and slash game that has enough RPG elements to keep things from getting boring, but not enough to qualify as a true role-playing experience. For those without much experience with RPGs, Dark Alliance is a good way to get your feet wet. Those who enjoy RPGs, but wouldn't mind a little button-mashing fun when it comes to combat should enjoy it as well. Basically, the gameplay consists of running through dungeons, or hallways, or swamps, and beating the crap out of whatever gets in your way. Because the ranged weapon system leaves something to be desired, combat mainly involves running in circles with your opponent as you try to hit him in the back without allowing him to hit you. Once you do knock your opponent off, you grab his stuff. Lather, rinse, and repeat until you can't carry anymore and have to teleport back to the local merchant to sell what you've collected. That's pretty much all there is to it, except that sometimes during the killing and looting you level up. That's where the RPG elements come in, as you mold your character by choosing either to augment his defensive or offensive abilites, or allow him the use of special attacks. As there's precious little use for diplomacy, you'll mainly want to make him or her more efficient at delivering and receiving the pain. Now, if that sounds repetitive, it is. I have to admit that I got bogged down on some of the later levels because they just seemed to be huge monster repositories. For the most part, though, dealing with the various different kinds of monsters and exploring the beautifully rendered environments keeps the repetitive nature of the gameplay from becoming boring. Although I found myself only vaguely caring about completing the quests or whether my actions were helping the people of Baldur's Gate or not, I did get to a point where I was acitvely interested in what there was to loot, as I was always trying to come up with the scratch to buy better weapons and armor. The other elements of the game the music, voice acting, and graphics also help to keep it interesting throughout. The graphics on the Xbox are especially good, with amazing water effects and impressive animations. The NPCs you meet have wonderfully expressive facial features and the enemies you fight die in different and entertaining ways. Although the fact that you can't change the angle of the camera hinders the effect of the lovely visuals at times, the detail of the evironments is still striking and adds much to the experience. The music is appropriately moody and lends a sense of purpose to your dungeon delving. The voice acting is also great, and helps to bring the story a greater sense of realism. You may not think about the quest you're on while you're hacking away in the field, but you do get pretty interested in what John Rhys-Davies will have to say about it once you're ready to report back to his character, Jherek. All of these elements come together to make a game that's very enjoyable to play while it lasts. You can finish the game in about twelve hours and may or may not be interested in going back through again. The two main bones the developers toss you for replay are a two-player cooperative mode and the ability to unlock a beloved Forgotten Realms character, Drizzt Do'Urden. Drizzt isn't a particularly beloved character of mine, so I wasn't immediately eager to go back through with him. I haven't played through with a friend yet, though, but it's obvious that such coop play would add a whole new level of enjoyment. All in all, though, I have to say that I highly recommend playing this game, even if just as a rental. It's an enjoyable way to unwind for an hour and a good value if you can find a used copy in a bargain bin. It's also a very good example of how to keep a bash-em-up game from becoming stale. Definitely rent it before you play Dark Alliance II, just to see how much the engine has improved.